Students say they aren't allowed breaks and refused leave to go home to meet their families. Nizampet, Hyderabad: They say they were virtually kept locked up in their college campus and made to study without a break by the college authorities. They were reportedly refused leave to go home to meet their families, even for festivals. The frustrated students allegedly revolted and damaged furniture, fans, beds, beches, lights, window panes and everything they could lay their hands on. Water storage tanks were thrown off the building. 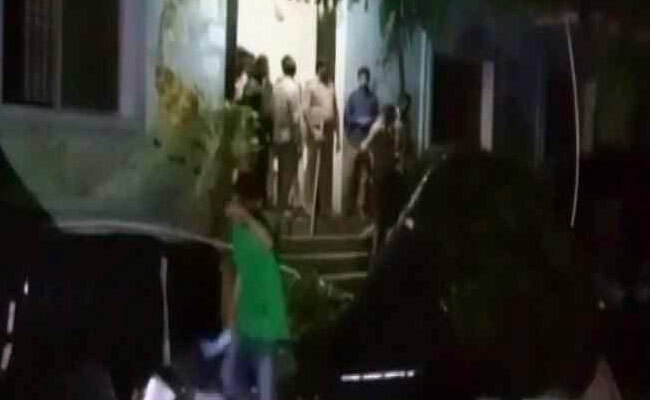 The incident happened today at Narayana Junior College, a coaching institute, on Nizampet Road, near Hyderabad. About 350 students of the senior section, equivalent of Class 12, stay at the college hostel. While it's unclear how many were involved in the violence, around 2 am, some students locked the front gate of their three-storey college campus, locked up the staff in a room and allegedly went on rampage spree. The college authorities, however, denied all allegations. Venkateswara Rao, hostel in charge, said the students had indulged in unruly behaviour and they suspect they had been instigated by a former employee. "We asked for home sick leave, we were told only juniors are allowed to go home. We are not given any break to go out of the college building. The food served here is also pathetic,'' one of the students said. The police were summoned but they couldn't enter the campus as the main gate was locked. The police used loud speakers to appeal to the students to stop the violence. "Yesterday, there was a worm in the food. When we showed that to the mess in charge, they said it was a twig and threw it away,'' another student said. The college had reopened in the last week of May after summer break. Students alleged that they are made to study long hours, often from 7 am to 10 pm with hardly any break. The students said it felt 'like being in a jail'. A student complained that the toilets remain dirty and issues about food go unaddressed. "Even when our parents come to meet us, they are not treated well,'' a student said. Child rights activist Achyuta Rao, who is a former member of the Telangana State Commission for Protection of Child Rights, visited the hostel and college today. ''Students are made to study 18 hours a day. They were not even sent home on summer vacation. They are not allowed to read newspapers. One boy told me his mother had sent some savouries wrapped in a newspaper and he was punished for it. In the quest to get results, what are we doing to the youngsters,'' Mr Rao told NDTV. He said they had opposed booking of cases against the boys and threatened that he would file illegal confinement case against the management if that happened. Inspector Ch Kushalkar told NDTV that no case has been filed as there was no formal complaint. An investigating officer said this reflected the frustration of the youth and their lack of tolerance and patience. "This kind of action is unwarranted violence. They can't lock up the place and break furniture just because they were not given home sick leave. The management and the parents need to counsel the students,'' he said.